_Maize flour idli _is tasty and full of nutrients.It is a special dish in a winters when we get bored from prantha roti etc. This maize flour idli is full of fiber.It completely satisfy your appetite.So serve it with peanut sauce or coconut sauce and enjoy it. Take a pan, add 2 tbsp oil after this add mustard and roasted it. Now, add chana dal and urad dal in this and cook it until it brown. Then add ginger, green chilli, curry leaves into it and cook 2-3 minutes. Now, add maize flour in this and cook it for 3 minutes. Put the mixture into a bowl. Now, add a curd, salt, coriander and water in this and mix it properly and get dilute it so cooked well. After 10 min mixture set properly. Take a cooker and add a water in it and place it on flame to boil. Take a idli stand and get smoother it with oil. Now, add a eno fruit salt into the mixture and mix it. Fill idli stand with this mixture. Place a stand in cooker and close it with lid but without whistle. Keep a flame to the point so that constant boiling of water. After 12 minutes open the cooker and refer to put the knife in idli. If the mixture not stickes with knife, means idli ready. Take out idli stand from cooker. Serve this tasty idli with peanut sauce or coconut sauce and green coriander sauce and enjoy it. Add eno fruit salt after all preparation. You can also use a consumable soda in place of eno fruit salt. You can also use a finely chopped vegetables in a mixture. You can also prepare idli in microwave. The procedure is same . 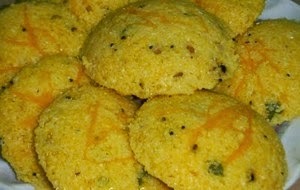 Keep the idli stand in microwave bowl and place it in microwave. Cook it for 7 min.